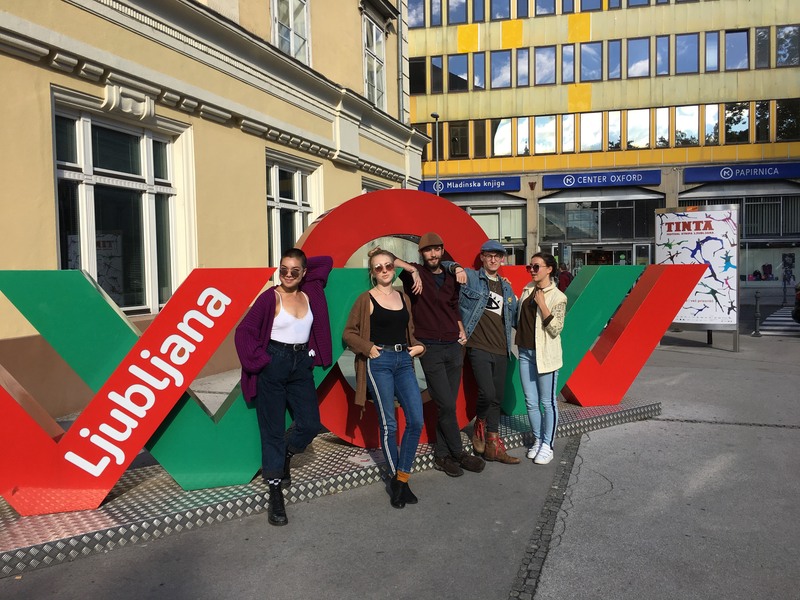 This week our theatre students Erika, Jake, Katherine, Elizabeth, and Colin talk about their excursion to Ljubljana, Slovenia last week! 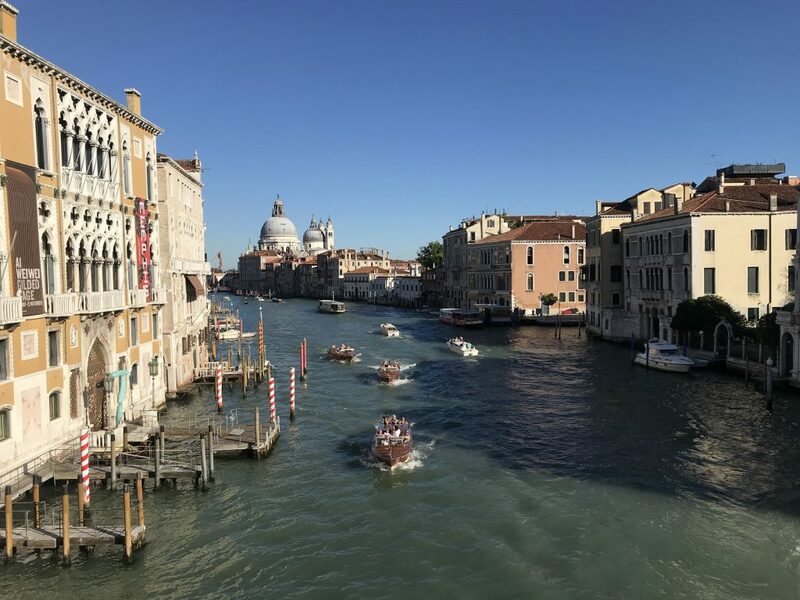 I am a firm believer in the perfect souvenir—there is nothing like finding the most spectacular material good to purchase to remind me of the places I’ve been. 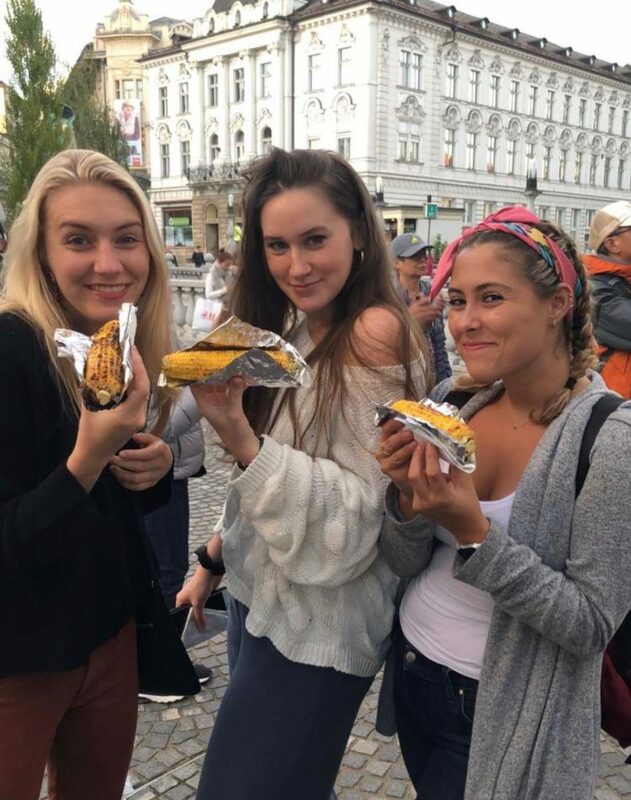 Last week, the theatre students traveled to Ljubljana, Slovenia to train with the En Knapp dance company. The training was awesome and intensive, and before the first day was over I knew that I needed something to commemorate our time there. We spent all week exploring the nooks and crannies of this spooky town, finding shops and markets at every turn. I waited until the last day to decide what my trusty souvenir would be. My friends were ordering sushi at a take away restaurant and I was loitering outside when I spotted it—the place I had been waiting for. I was standing in front of a local honey shop with bright yellow doors and a friendly face in the window. I walked in with no warning to my friends and immediately knew I was where I was supposed to be. I asked the woman in the shop if she spoke english, and she did. I wasn’t walking around for very long before I asked her what she recommended. She said her favorite was the cinnamon vanilla creme honey, and offered me a sample. Quite honestly, I was ready to buy a jar based on the name before I even tasted it…BUT THEN I TASTED IT. 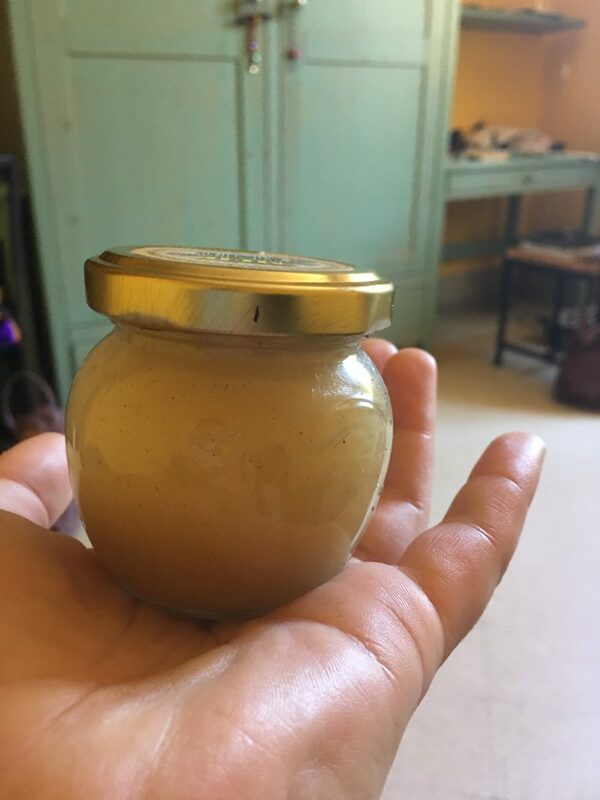 I am not exaggerating when I say: This Honey Changed My Life. …Ok, maybe I’m exaggerating a little, but seriously! This honey tasted like pure joy and warmth going down my throat. I purchased it in a second, and have been putting it in my tea and on my toast every day since we’ve been back in Arezzo. It tastes like our week in Ljubljana. I love a good souvenir! 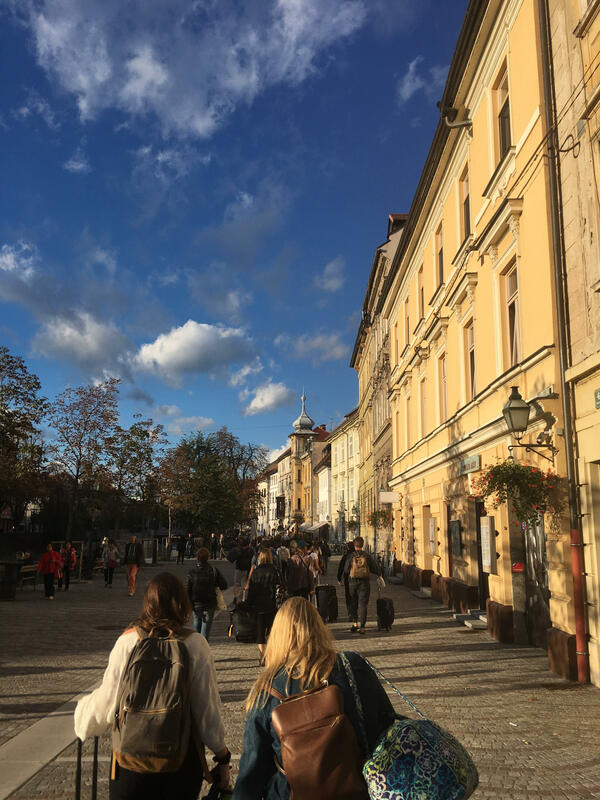 Our couple of days in Ljubljana were wonderful! The second we stepped off of thebus that afternoon I was hit by how different the city felt compared to Arezzo, or anywhere else in Italy I’ve been to. The architecture, the people, the TEMPERATURE, all felt so eastern Eu ropean. Almost everybody we encountered spoke near perfect English, so getting around wasn’t a problem at all, and going out after our day programs ended up being a lot of fun. The program itself wasn’t exactly what I expected. Going into it I had been told by alumni that it would be the sweatiest two days of my entire life, but it didn’t end up being that way! The program focused on (after warming up with pilates) learning a phrase of choreography and then adapting that phrase into something new in small groups, and then combining it all into one big exposition. The process was very collaborative and engaging, and really asked us to get creative with it. 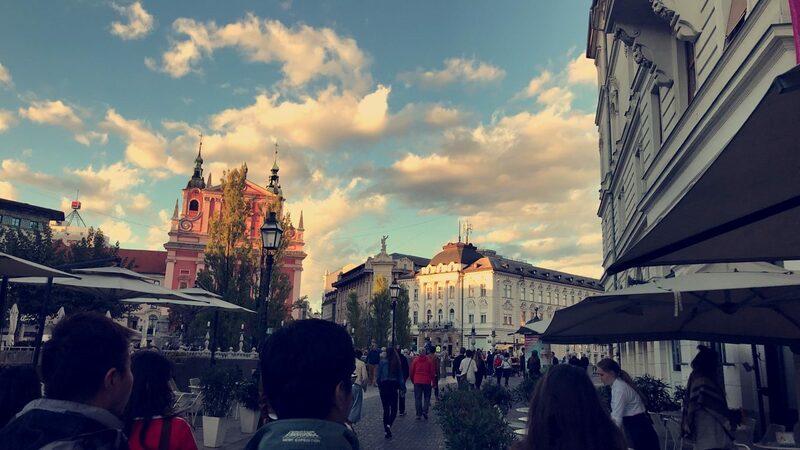 For sure would recommend Ljubljana to anybody interested in visiting, it’s a busy little city in a relatively small, young country. Also, there are far fewer hills there than there are in Arezzo. 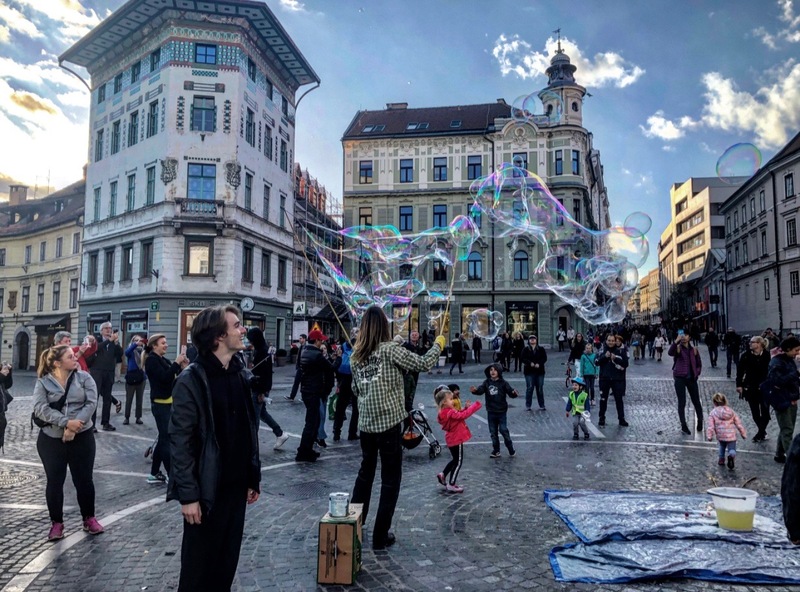 I was beyond pleasantly surprised with our trip to Ljubljana this past week. I had never been to Slovenia before, so I had no expectations as we boarded the bus on Monday morning. The city itself was truly beautiful, and we were lucky enough to be staying right in the heart of the town square. All along the canal were shops, restaurants, outdoors bars, bridges over the water and performers on the streets. Everything was in walking distance, and it was the epitome of a picturesque European city. I was so happy we went as a class, because otherwise I don’t think I would have found this hidden gem by myself during my travels while abroad. It is one of my favorite places that I’ve ever visited, and I’d be lying if I said I wasn’t a little sad when we had to leave. However, now I know that there is a reason to go back! I was/ am extremely happy I got the opportunity to explore that corner of the world. Our work with the dancers from Plesni Teater was intense. We did pilates as a warm-up in the morning, which I actually really enjoyed, and then went on to learn some choreography. Now, many of us are not dancers and most of the movement we do at the accademia is based in improvisation. So learning a set of choreographed movements was challenging. Let’s just say, I won’t remember any of the steps that we learned over those two day workshops, but I will never forget the bruises I got from sliding and rolling on the floor. But apart from the ambience of Ljubljana and the dance workshops, my absolute favorite part was le petit concert we got from Tomaz Grom, a bass player. However, what he performed for us was not what we expected, in fact he did just about everything but “play the bass”. Grom dragged the bow on the wood under the strings, he knocked on it, he pressed in the strings. And he didn’t stop with the bass either, he brought out a banjo and a large rock, and pushed the rock into the strings with such a force, that an eerie plucking sound amplified the room. It was wonderful madness. We even got to be a part of the performance he improvised with one student while she danced, and another while he recited a Shakespeare monologue. My jaw was dropped for almost the whole concert. We learned recently that Grom’s performance art with instruments is largely based on the works of John Cage, a composer and music theorist, known for his avant-garde and non-standard music. Though our week in Slovenia was thoroughly exhausting, it was also so incredibly fruitful, and I so did not expect to love it as much as I did. I’m excited to return in the future.